According to some statistics I ran across on the internet I was amazed to learn that globally approximately four children are born every second. That’s about 250 every minute, 15,000 every hour, 360,000 every day – every year about 131.4 million babies are born. That’s a lot of crying babies! A question comes to my mind : “Does the birth of a baby – any baby for that matter – make a difference to our world?” The answer of course is “Yes, indeed!” How different our world would be today without the likes of Henry Ford, Clara Barton, Steve Jobs, Rosa Parks or Jonas Salk. All of them were babies just like you and me. Babies who grew and developed, babies who became adults and eventually altered and improved our world. On the other hand, how much better off would our world be if the likes of Adolf Hitler, Joseph Stalin, Idi Amin, and Pol Pot were never conceived, never born? How much suffering, death and pain would have been avoided if their parents had never met? We will never know! All babies are essentially the same in every time and in every place. They all leave their mothers’ wombs wet and screaming with flailing legs and arms with some slight, superficial variances. These variances aren’t important. It’s what’s veiled inside each child that is fascinating. Will this child be a saint or sinner, a maker or taker, a lover or hater? Over 2000 years ago a child was born in a distant, poor, insignificant corner of the Roman Empire. He wasn’t born into great wealth nor did he enjoy a prestigious family name. He was like all children of his age who were fortunate to survive the traumas of childbirth. Could Mary and Joseph imagine the impact this child would have on their world, on our world? This child would eventually become the “criminal” who’d pay for our crimes. What love that was indeed! 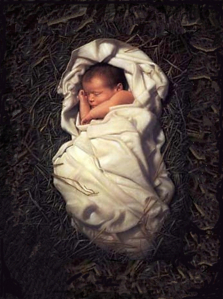 All that love was dormant in the body of this child born in a manger. Who could have imagined? The birth of the Son of God has changed our world but much still needs transformation. Sin still has a hold on us. The child born two millennia ago has given us a way to move forward. His birth has had an impact but it hasn’t achieved its final end. We still need missionaries to go out to our world bringing his message. Our work as a missionary Church continues. So does the birth of a child make a difference to our world? For sure! Nevertheless, the full impact of Jesus’ birth two millennia ago has not achieved its ultimate goal: “peace on earth and good will to all.”(Lk 2:14) Merry Christmas!